I normally decorate the Christmas trees and put up all of my other decorations the day after Thanksgiving but this year I am a little behind. As I have been out and about, I have seen many cars with the bundled up tree on top of their roof which makes me all the more excited to get started! At least for now, I can look at Christmas tree decorations and get a plan for what I want to do. Since we will be celebrating our family Christmas at our cabin this year, I also needed a tree there. This I at least did get a start on with a purchase of a new….small…tree and a few rustic ornaments that I put up last weekend. I had to resist the temptation to buy more since I have plenty that I can bring up and have plans to make some more. I already put together some super easy ornaments made from vintage fishing net floats! So, since I can’t show you any of my trees quite yet, I found some of the best decorated Christmas trees to show you that are in a rustic style. 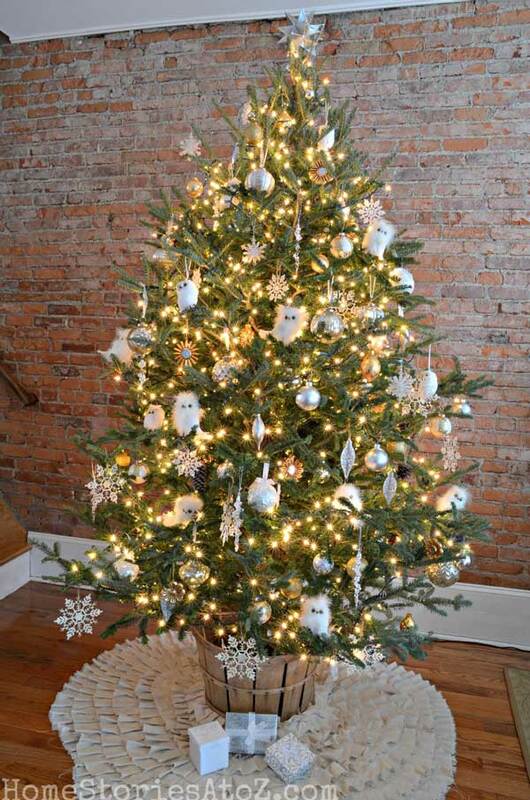 I just love the cute fuzzy white owls on this tree! However, one of the best parts is that old bushel basket that the tree stand sits in. A small stand can just sit inside but a larger stand will work too. See how this is done by checking out the bushel basket stand cover tutorial from Home Stories A to Z. 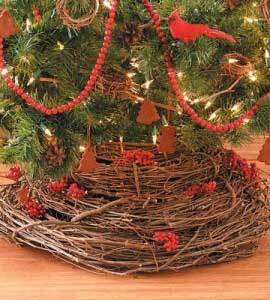 This rustic Christmas tree is full of little nests, grapevine wreaths and birds. However, the most interest lies at the bottom of the tree! The skirt is made from several grapevine wreaths. See the tutorial for the grapevine tree skirt at Country Woman Magazine. A Christmas tree full of rust is just as good as silver and gold! This one is packed full of old rusty metal which is contrasted nicely by the burlap and white garland. You can’t get much more rustic than this! 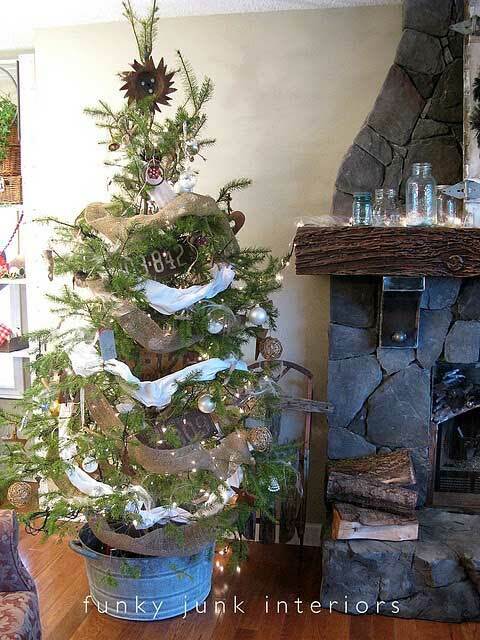 For a more rustic chic Christmas tree, I am loving this look by The Lily Pad Cottage. 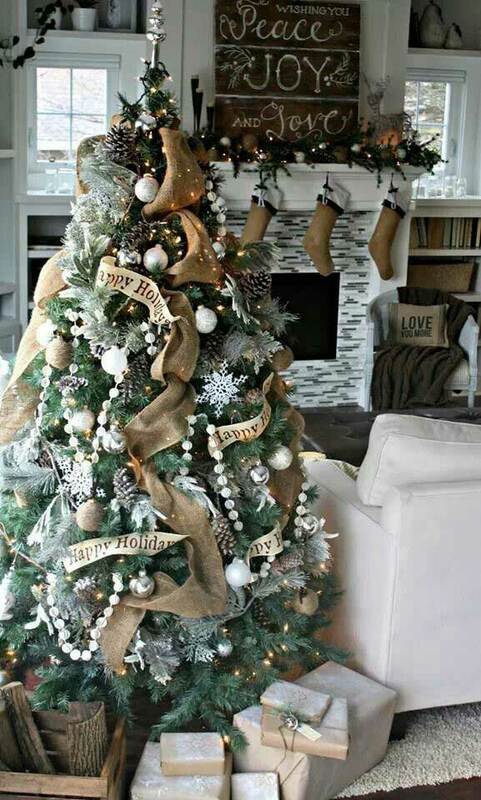 The blend of burlap and white mixed with pinecones and snowflakes is such a soothing and chic style. 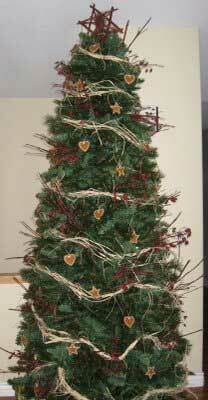 And finally, this last Christmas tree was super inexpensive to decorate but still looks amazingly festive and rustic. From raffia garland to dogwood twigs and other trimmings, the decorations were practically free. Check out all of the details plus a cookie recipe, for the cookies hung on the tree, at Belly Acre Farm’s decorated Christmas tree. I absolutely love them all. Especially the first one. Looks wonderful in front of the brick wall. Love the fuzzy owls! Haven’t got my tree up yet, but you sure have inspired me to get started. Thank you so much for sharing such wonderful ideas.